I adore filled chocolates, and while there are some stunning chocolate shops out there, it is fun to make your own: not least as you then get to experiment with different fillings. 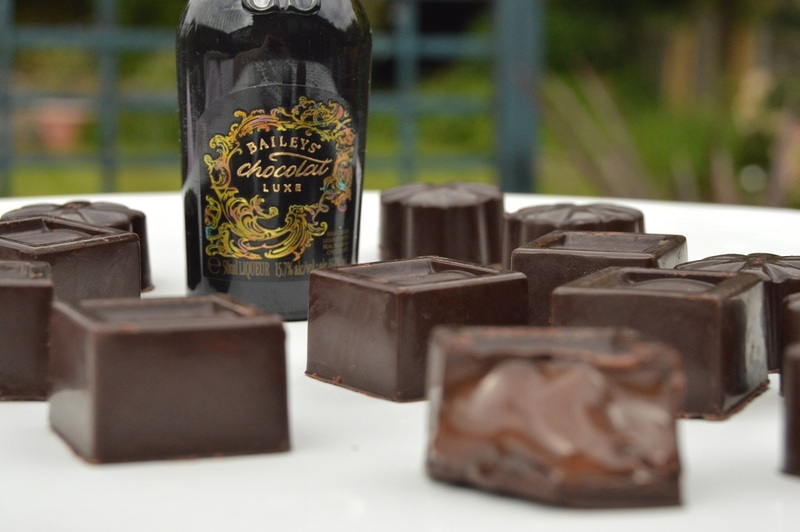 I was recently given many mini bottles of Baileys Chocolat Luxe (utterly gorgeous when drank ice cold! ), and I fancied using some of them as the basis for fillings for some of my chocolates. Mind you, I have made these chocolates using traditional Baileys. These are very simple chocolates to make and I think they taste as good as any you can buy – and for a fraction of the cost. Really good quality chocolate makes the world of difference to home-made chocolates, and indeed with anything when chocolate is used in the kitchen. You don’t need to spend a fortune either for good chocolate: there are some excellent supermarket own-brand chocolates out there that are inexpensive, and as long as it is a chocolate you like, the end results will be great. 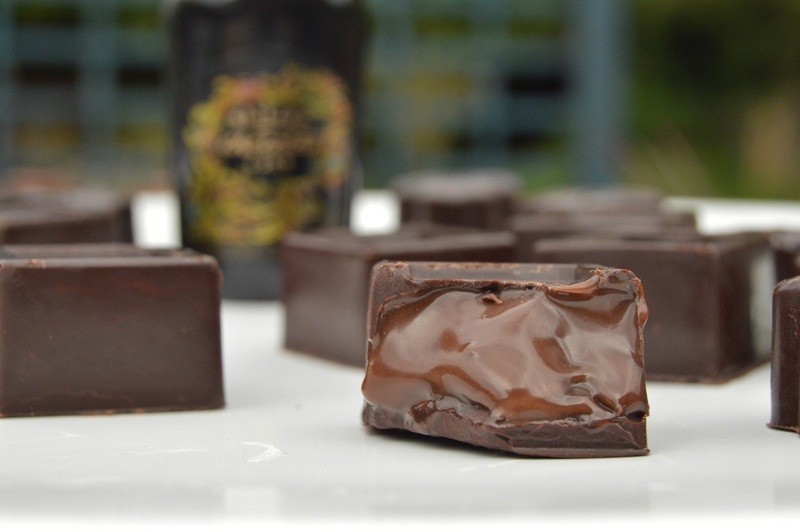 A very soft, boozy ganache! I have made a very soft ganache filling here, using more “liquid” (cream and Baileys) than chocolate than I would normally go for with ganache: this gives a centre that is very soft, almost to the point of being runny. If you prefer a firmer filling, use equal amounts of chocolate to liquid. Top tip: to avoid ganache splitting, add the hot cream mixture to the bowl with the chocolate in and not the other way round: if you add the chocolate to the hot pan you risk it splitting when you stir it together. Leave for a few minutes before stirring to melt the chocolate. To temper or not to temper….? The tempering gives a wonderfully crisp texture and a shiny finish whereas just melting the chocolate gives a duller, softer finish. Taste-wise, there is no difference, although I usually do temper my chocolate when making filled chocolates as I love the contrast between the crisp chocolate and the soft filling. You can put the chocolate to set in the fridge, but it is likely to bloom a little (discolour) and is prone to a little excess condensation from the fridge which can affect the crispness of the chocolate. However, this does not affect the flavour at all and to be honest life can be too short! If you have a wine fridge, which controls the humidity better, pop them in there: just clear a shelf of wine while they set. I find I get the best results leaving them in the wine fridge. (1) Pour a little chocolate (about a teaspoon) into the base of each mould and rotate several times to cover the base and sides. I also invert them over the bowl I had melted the chocolate in so that any excess chocolate drops back into it. Leave to set, ideally at room temperature but chill if you want to speed things up. NB: you want to get a fairly thick shell, otherwise the chocolates might break when you turn them out. If you see any gaps in the set chocolate, spoon a little more chocolate inside and repeat. (2) Make the filling: heat the cream and Baileys until it just comes to the simmering point. Remove from the heat and pour over the chocolate. Leave for a few minutes and stir until the chocolate has dissolved. Leave until cool but not set. (3) Spoon or pour the filling into the moulds, coming just below the rim. Leave until the filling has set. (4) Spoon the remaining melted chocolate on top, covering the filling completely. Run a palette knife across the top to flatten the surface. Leave until the chocolate has set. 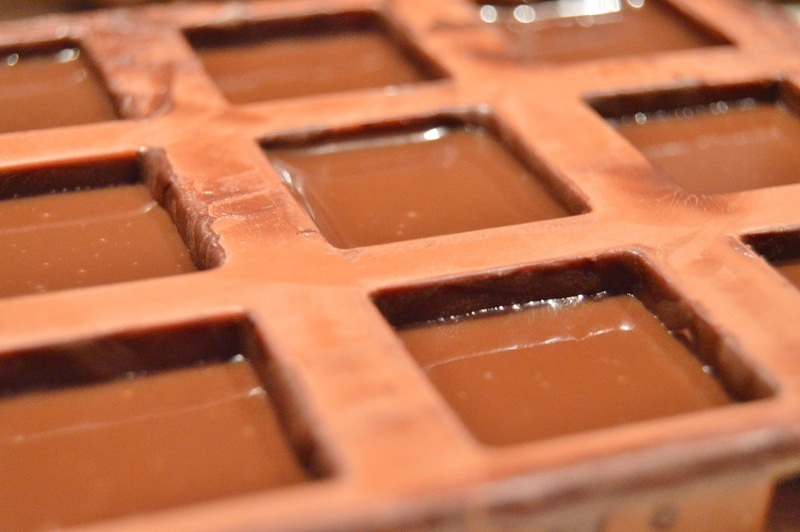 (5) Carefully remove the chocolates from their moulds. And Christmas is coming which gives me plenty of time for test batches and tasting to be sure I am skilled enough for Christmas present gifts. Thankyou for these helpful and easy to follow directions for these lovely morsels. These look scrummy. Never thought of using the wine fridge. May have to drink a shelf full to find room.